​​​ ​​LEWISVILLE – Developers have started construction on the second phase of the $1.5 billion, 324-acre Realm at Castle Hills development on SH 121 west of Josey Ln. Canyon Real Estate Partners is providing $14.7 million in funding to kick off the second phase with a 260-unit, five-story apartment community with ground-floor restaurant and retail space. The project will include offices, retail, restaurants, and apartments. It is scheduled to open in fall 2020. The first phase started last year and includes a nine-story office and retail building. 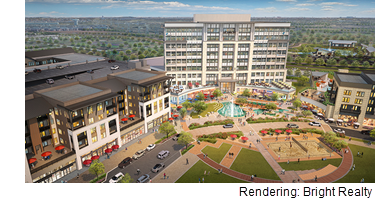 Future phases of The Realm will include condominiums, an amphitheater entertainment district, more retail, restaurants, and additional apartments. The development was designed by 505 Design and BOKA Powell. Andres Construction is the general contractor. BB&T provided construction financing.